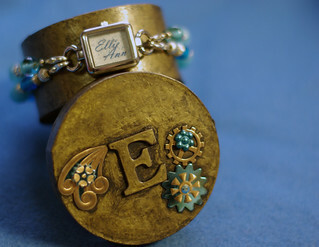 Bracelet watch and steampunk gift box for my friend and soon-to-be published author, Ellie Ann. Her book, The Silver Sickle, is coming out in July! I figured she could wear the bracelet to book signings, and when it starts to feel unreal, look at it and realize, "It really IS me they're all here to see."